The exclamation mark in the title of MOTHER! should serve as an ample warning for anyone journeying off the cinema to seek out director Darren Aronofsky's latest offering. His new supernatural horror thriller (if that simplistic label even does it apt justice) received equal parts cheers and boos when it premiered at the Venice Film Festival, and after seeing it I can most definitely understand why. As I left my screening of MOTHER! and pathetically tried to process my thoughts about it I was overcome with instant feelings that...I hated it. A few hours - and a restless night's sleep - went by and I ultimately decided that I both paradoxically admired Aronofsky's audacious vision and ambition...and still hated it...if that's even possible. This review's gonna be tough. Describing MOTHER's story - if you could even call it that - would be a maddening process, perhaps as maddening as the film itself. Plus, it would ultimately evolve into rampant spoilers if nitpicked in serious detail, so all I'm inclined to initially relay is that the film is about a young woman and her older husband and how their relative peaceful life in their country home is forever changed by the arrival out multiple outsiders. However, seeing as the story begins with a hauntingly ominous image of a charred woman staring into the camera and said country house being magically restored to its pre-destruction luster, there are hints that MOTHER! will be anything but a linear and prosaically plotted film. Aronofsky has been know as a fairly throw caution to the wind cinematic voice that's unafraid of pushing extremes or tackling any challenging genre. He's made many films I've loved (BLACK SWAN and THE WRESTLER), some films I've felt indifferent about (NOAH), and some that I've downright detested (THE FOUNTAIN). 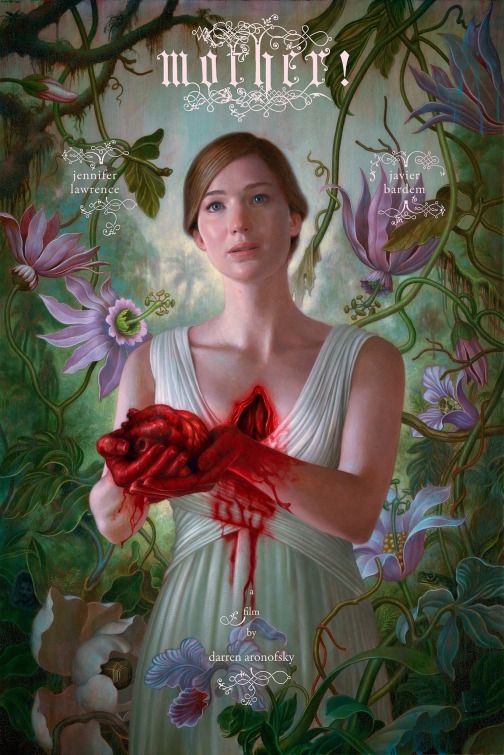 MOTHER is not the qualitative disaster that its mostly unprecedented "F" rated Cinemascore would relay: it's far too well acted and compellingly conceived to be written off as a total failure. Yet, it's unavoidably self-indulgent to the extreme, monumentally pretentious, and a clinically cold and distancing work. I don't think that I'll ever want to watch MOTHER! again, but I also will never forget my experience of seeing it. Aronofsky reportedly wrote this film's script in under a week, and it frequently shows as the narrative meanders from one increasingly bizarre, macabre, and hallucinatory vignette to the next. You just have to kind of applaud his untamed audacity to simply go places in MOTHER!. Even when the plot spirals towards some deeply apocalyptic horrors as it culminates in one of the most chaotic, shocking, and (many would say) distastefully extreme climaxes in recent memory, Aronofsky is operating at a viscerally potent aesthetic level that's impossible to dismiss. That, and he's clearly absconding away from the obligatory accoutrements of the horror genre and seems hell bent on freely abandoning any pretence of storytelling logic and flow. Part of the reason why the marketing campaign to MOTHER! is so categorical wrongheaded - which, to be fair, has led to those remarkably jaded Cinemascore ratings - is that it doesn't match what's actually on screen; it's advertised as a conventional horror thriller, but is anything but conventional. I can understand why this film has been both applauded and reviled in equal measure as a result. As for the story itself? I'll endeavor my best to describe it. Characters are slyly given no real names outside of basic descriptors, so let's just say that Him (Javier Bardem) is a somewhat struggling writer that's trying to settling down with his wife, Mother (Jennifer Lawrence), in their spacious and rustic home in the middle of relative nowhere (no geographical location is hinted at and we never see any of the larger world around them). They appear like a happy and content pair, but their marriage seems to have hit an awkward stage where they feel emotionally apart despite loving one another. Him is dealing with writer's block while Mother tries to create an environment of mental rehabilitation by redecorating and restoring their house. One fateful day a stranger comes by their home uninvited, Man (Ed Harris). He claims to have thought it was a bed and breakfast, but when he realizes who Him is he reveals what a big fan he is of his work. Him decides to let the apparently homeless Man stay, much to Mother's chagrin and worry. Things soon begin to spiral out of control when Man's wife, Woman (a deliciously snarky Michelle Pfeiffer), appears, and within no time it appears that Woman takes great pleasure in pushing Mother around and using her home however she sees fit. Things take a turn for the worse when the couple's sons arrive, which leads to a very bloody altercation between the siblings, leaving one dead. Him feels obligated to have a funeral for the couple and their friends and family, which leaves Mother growing increasingly on edge and ill at ease, seeing as more and more people come to her home and freeload off of her and take advantage of her hospitality. As Him begins to pay more attention to the massive number of new houseguests - as well as his newfound creative surge in his writing - Mother begins to psychologically unravel when the houseguests take - shall we say - a hellish turn for the worse that's positively Biblical. Trust me when I say this, but I've only really just scratched the surface of what MOTHER! is about and have remained relatively tight lipped about just what in the hell is going on in this film. Even though Aronofsky grounds the proceedings with a level of performance naturalness out of his actors (all of whom that are thanklessly good here), MOTHER! superficially feels like it's occupying a normal plane of earthbound reality, but deep down it's more like an ethereal nightmare replete with disturbing dream imagery. Part of the entrancing allure of the first half of MOTHER! is that Aronofsky invites viewers in to journey alongside its titular character to make some semblance of actual sense of what's happening around her; the film is like a jigsaw puzzle without all of its pieces neatly fitting together early on that compels you to solve it. And MOTHER! conjures up some imagery of spooky power throughout, like recurring visions that mother has - when touching her house's walls - of a giant decaying and dying beating heart. Then there is this very peculiar blood spot on the floor that, not doubt, continually baffles Mother as much as audience members. Aronofsky also shoots MOTHER! with a lot of tight close-ups of Lawrence, which visually symbolizes how the house and guests around her are starting to have a claustrophobic stranglehold on her sanity. The film's thematic aspirations are commendable as well, seeing as there are layers upon layers of possible interpretations of meaning here, some of which are more illusive and out of reach, whereas others are glaringly obvious and are beaten over our heads. There's subtext here about the narcissism of creators (in more than one form) and how that's a destructive force in terms of its effects on loyal followers. This also ties into notions of modern celebrity culture and how ravenous fanbases take their support of those they idolize to fanatical extremes. More obviously, MOTHER! dives headfirst into some pretty blatant religious and environmental symbolism not only with the characters of Mother and Him, but with those around them that have this unquenchable thirst to exploit them in whatever means they see fit. As the film plummets towards its third act - which, to be fair, shows Aronofsky at his most technically assured and confident - the story begins to draw parallels between religion and cults that will unreservedly touch many nerves. It's at this point when MOTHER! echoes Roman Polanski's ROSEMARY'S BABY, even though the former achieves a level of unforgettable grotesqueness and shockingly graphic carnage that will make Polanski's film feel positively tame by comparison. MOTHER! is risky in the places it goes to, but even I would have to concede that those places are so uncompromisingly disturbing and appalling that you have to begin questioning Aronofsky's lack of tactful restraint. There's a difference between polarizing your audience and engaging them in primal shock value to the point of sending them fleeing for the exits. For all of the allegorical ambiguities that built up to MOTHER's finale, it's all but sabotaged by its filmmaker's incessant yearning to push buttons and revel in scandalous moments of tasteless excess. And that's where the film lost me. The actors, God love them, keep this whole ghoulish enterprise afloat, with Lawrence in particular demonstrating an uncommonly ferocious dedication to her role that requires her to be an emotional and - in the end - physical punching bag as a poor victimized soul. She also has to serve as the audience conduit, acting with logical astonishment and confusion to the madness that surrounds here the same time viewers are. MOTHER! is rich and sumptuous on a level of performance commitment and stylistically is as potent as anything Aronofsky's has ever conceived. Yet, the director's own smug and self-congratulatory end game here in terms of mind screwing with audiences and alienating and angering many in attendance is really the film's undoing. Much like Man in the story, Aronofsky is so wrapped up in his grandiose abilities to create that he confuses his film with something that needs to be apathetically endured instead of compellingly interpreted. Fans of his work will come out of MOTHER! loving its go-for-broke courage, vision, and overall insanity, whereas others will find it an insufferably mess with confounding multiple messages.